Care4Calais work closely with FAST, a volunteer group of healthcare professionals from the UK and the Netherlands who come to Calais and provide first aid support. They provide refugees with a crucial first point of call regarding health issues, identifying when people need emergency healthcare but also giving wound care advice and bandaging, over the counter medication and general first aid care. 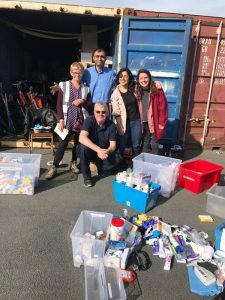 The team will often accompany Care4Calais on distributions and are invaluable in helping with the many problems arising from the low living standards to which the refugees are exposed.